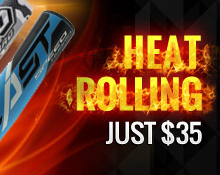 Our popular heated bat rolling service is customized for every bat model weight and length. We welcome you to send in any bat you have, new or old, composite or alloy. Our heated rolling treatment is unmatched in the industry and we offer a full satisfaction guarantee on this service. Bat rolling is an "accelerated break-in" treatment, as it will take a new bat out of the wrapper and make it hit better as a well broken-in club. We guarantee no dead spots and a larger sweet spot on any bat. 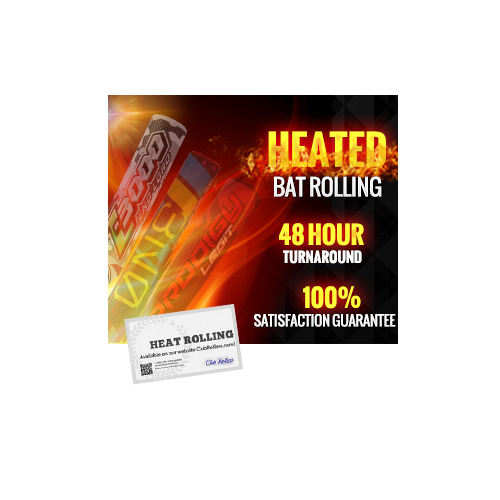 This heated bat rolling service will also not void your current manufacturer warranty considering they do not ask. Modern bats are overbuilt to exceed manufacturers warranty's and nearly all players never hit hard enough to break it in completely. As a bat gets used it naturally becomes hotter, we simulate the process with our slow heat rolling process so you get a true hitting machine from day one. Use coupon "freeship" at checkout for free 2-Day return shipping back to you. We require all bats to be sent to one of our locations, we guarantee a 48 hour turnaround on our heated rolling service. The 48 hour guarantee only includes business hours when we are able to ship. A ship-to address will be supplied on your receipt right after checkout. Your local post office has a box that fits a bat or two perfectly, you could also use Fedex or UPS if you prefer. Satisfaction Guarantee: Our guarantee is simple, if you are not completely satisfied with this service we will refund the total minus $10 to cover shipping costs. Please leave a review and we will give you 10 credits to win our monthly giveaway!